At the airport on my way home to Edgewater, New Jersey from a four-day vacation in Las Vegas. 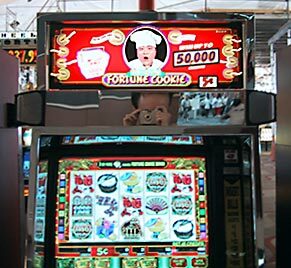 While waiting for my flight, I thought I'd try my hand at Fortune Cookie, a video slot machine featuring Mr. Lucky (pictured) who has to be one of the most politically incorrect characters I've ever seen. When you win a bonus, he reads (in a Charlie Chan accent) from his Chinese food menu and tells many awful jokes. Anyhow, I put in $20 and left with $20. I wish I had that much success during the rest of my time in Vegas.